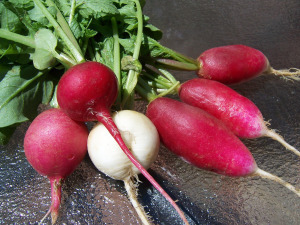 Radishes are a sure sign of spring to me. The ones you grow yourself will be quite different from the one you get in the plastic bags at the supermarket. Radish sandwiches are awesome–with a little salt and European-style butter on pumpernickel (especially freshly baked) accompanied by a glass of champagne. We don’t usually think of radishes being treated as a vegetable. Here are some other things to do with them, e.g. radish soup. I grow a lot of radishes. My husband, who’s not keen on too many vegetables, loves them. As does his father, who regularly sits down to an entire bowl, which he eats plain except for a sprinkling of salt. So every spring I make sure to put in a healthy radish patch, just to make sure I have some left for me! The two varieties I’ve been regularly growing for the past few years are Easter Egg and French Breakfast. Easter Egg is actually a mixture of varieties, which is one of its primary advantages. Radishes grow very quickly (mine mature anywhere from 4-6 weeks from sowing, depending on the weather), and they also quickly pass their prime. Sowing a mixture of varieties helps space out the harvest a bit, and with Easter Egg, you have that variation built in.